Extended care is a wonderful option for families in which both parents are working outside of the home. The program is offered to our K3 and K4 families and is centered around the hours of our preschool program. Your little one will have many opportunities to explore their creativity through a variety of arts, music, and puppets. 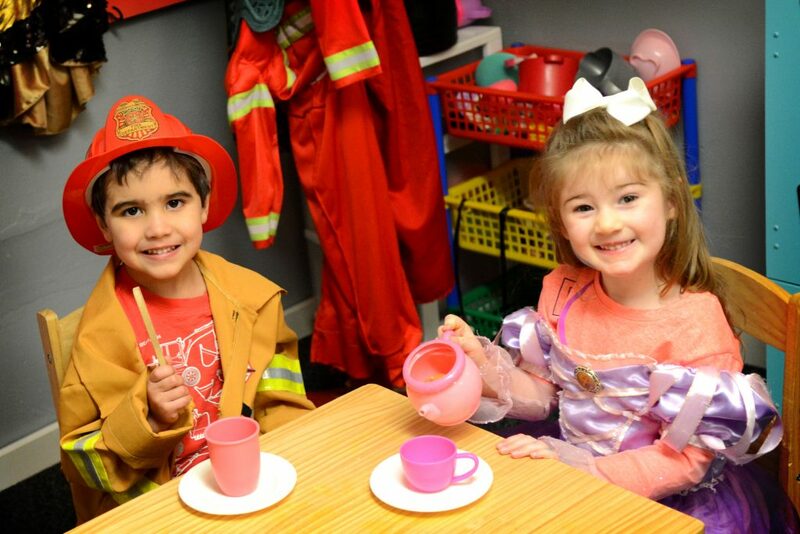 Their imagination may take them to a land with castles and beautiful princesses or dressed as a fireman and working hard to put out the latest fire and rescuing others from danger. Creativity shines through the many options of “play engineering” and developing their motor skills. Students relocate from their preschool classroom on Tuesday, Wednesday, and Friday to the extended care classroom. They are served lunch, have activity time and a rest period, enjoy a snack, and participate in learning centers. The extended care fee is $175.00 per week. This fee includes preschool and extended care. Lunches are a separate fee. Due to the limited size of our daycare, the $175.00 weekly fee is a flat fee. If students are absent, the fee does not change. The extended care fee is calculated for a 10-month pay period with equal payments to round out those 5-week months. Therefore, the fee is $600.00 per month, to be paid by automatic bank drafts, August through May. We would love to assist your family by enrolling your K3 or K4 child in our program. Our openings for extended care are very limited. If you are interested, please contact Debbie Nesbitt at (479) 442-2565 or debbie.nesbitt@fayettevillechristianschool.com. After school care is provided by our 2nd grade teacher, Mrs. Cristi George. Students have the opportunity to complete their homework under the supervision of Mrs. George so they may enjoy family activities later on in the evening. Students enjoy a time of relaxation from the rigorous studies of the day once homework is completed. Games, movies, Legos, Calico Critters, Ipads, and other options are available for the children’s entertainment. A variety of snacks are available to choose from. After school care is available 3:30-5:30, Monday through Friday. The fee is $8.00 per day, per child, and is paid directly to Mrs. George.